With the number of serious incidents involving cyclists on British roads, seemingly increasing, we have seen the formation of various campaigns and institutions to improve road safety supported by the Times newspaper and charities such as Sustran. As a reaction to this the UK has implemented Cycle demonstration towns, National Cycle Routes and Cycle Superhighways in London. We are currently awaiting the publication of Transport for London (TFL) “Cycle Vision” strategy document, to see how the Capital city intends to implement further improvements to the current situation. All of these ideas still point to the need for further improvement of Cycle routes for Britain’s cyclists. 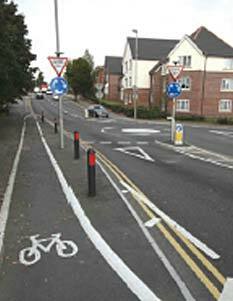 The painting of lines on the highway does little to protect, with other road users simply being able to cross over into the cycle lane with little or no warning. 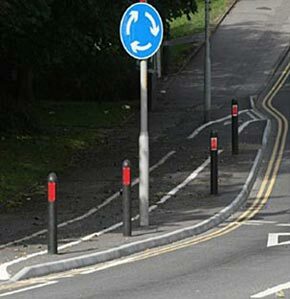 We appreciate that not all roads lend themselves to applying a new kerb line with raised cycle way, but where this is an option, it gives a safety barrier between motorists and cyclists. Our solution can range from kerbs 40mm to 160mm high in standard concrete finish, but as an option, a high visibility coating can be factory applied with a reflective finish in white, black and other colours. We are currently working on further developments to the Scan Kerb solution, including a 40mm ribbed low kerb to give audible warning if driven over. The Scan Kerb product is a simple alternative to traditional kerbing, it is a pre-cast concrete kerb with a pre applied adhesive on the base, with the application of a primer to the road surface and heat to the base of the kerb it is simply stuck in place (see video to the right), the asphalt surface can then be rolled against the back of the kerb as in traditional construction. The use of Scan Kerb removes the need for breaking out the exiting surface, noise and dust pollution are eliminated as is the need for cart away of excavated material, the speed of application can drastically reduce the overall contract period and cost. We are eager to work with additional Specifiers & Engineers to fine tune our already existing innovative range of kerbing solutions and would welcome your suggestions and enquiries to help resolve any design issues you may have.